My Virtual Sundial is closely based on the actual Nef Solaire which was built in 1993 at a motorway stop near Tavel in the Midi of France. Designed by sculptor Odile Mir and well-known "gnomoniste" Denis Savoie, this is one of the largest and interesting dials in the world. 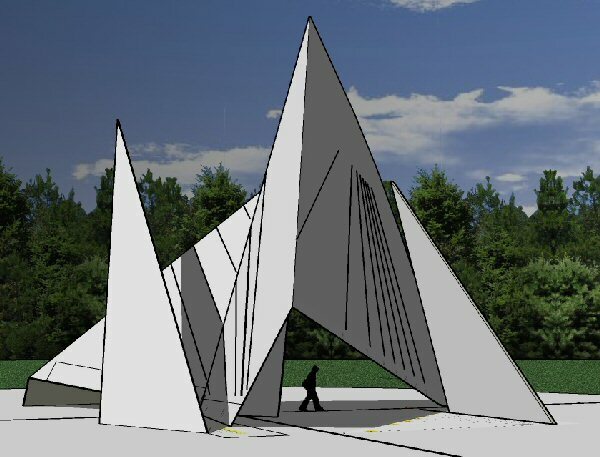 This huge structure , shaped rather like a ship or a cathedral, consists of four "sails" of white concrete, joined together with the highest point at about 54 ft. The total weight of the "sails" is in the order of 240 tons. In order to see how the sun and the dials' gnomons works together to tell the time, you need a correction table for each date in the year showing the difference between solar time on the dial and civil time in France. 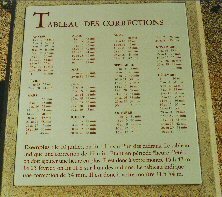 Here is a photo of the correction table at the actual Nef Solaire at Tavel.